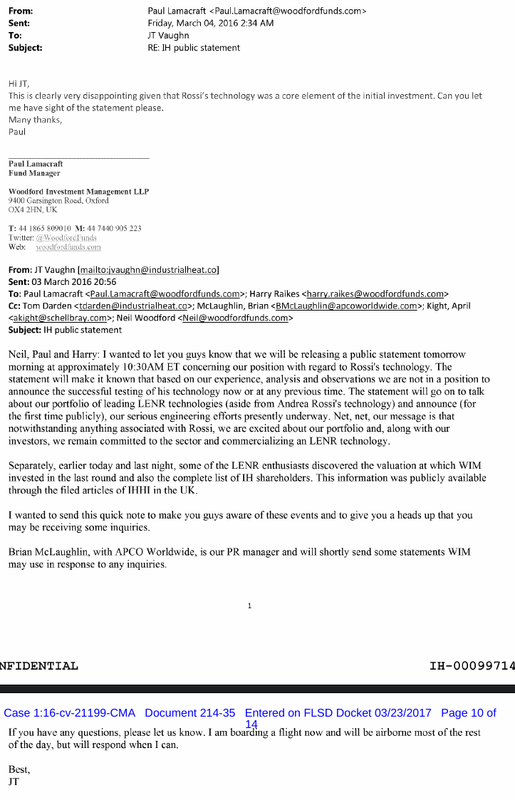 It could very well be that the significant increase of astroturfing activities by the likes of Fred Zoepfl and Dewey Weaver is due to the fact that a lot of the current Industrial Heat share holders are extremely eager to sell at the current valuation on Woodford books. And in order to facilitate and enable this to be done they more than ever need to push the narrative that Rossi has nothing. Because they know time is running out – and they desperately need to find the bigger fool to dump their shares on … If I had any interest in the Woodford Funds I would get out now – because those are going to get hit. 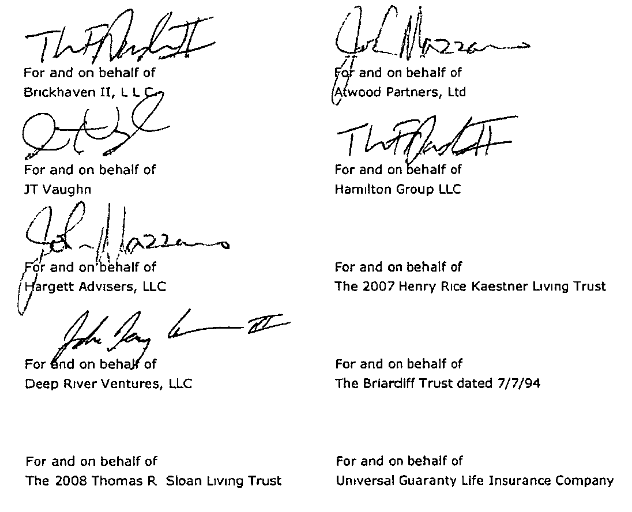 It’s a bit hard to know who are the large shareholders of IH except for Darden and Dewey of course. This list was published in 2016 (Dewey Weaver is Deep River Ventures, Darden i Brickhaven, etc.). 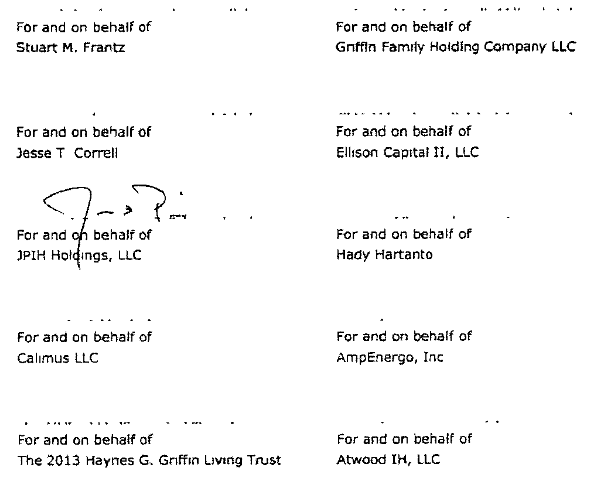 Some of these entities however seams however to already have made a nice exit using the Woodford cash raised according to the IH business plan. Recently there have been more focus on Woodford and their investments. Especially how they structure their investments using offshore entities. So I have been taking a close look at what this is all about. The main issue here is the valuation of IH and how this $4 billion valuation relates to the progress being made by Rossi. Obviously this progress is freaking them out right now which has increased the activity of the astroturfers. Is APCO still involved? We know they have been so before so it would be no surprise and they are used to defend douche bag businesses in the past (tobacco etc) – no doubt. Further down I cover the actual assets of IH, and in my opinion following this saga since 2011, those assets are nowhere near worth $4 billion. My estimate is that a 99% depreciations is needed (at least). Industrial Heat is a $4 billion balloon. And Woodford are initself on some trouble lately since having out flow of investors and using offshore structures to circumvent regulations of large holdings which cannot easily be sold – because there is no market for them (like Industrial Heat). So they “fake” an exchange on Guernsey. The legal detail are somewhat unclear, but here are some articles on the citywire site. Woodford’s controversial stake in cold fusion specialist Industrial Heat, held across the Equity Income fund and Patient Capital investment trust, was listed in Guernsey last October, two weeks after the shares were revalued 357% higher. Stakes held by other investors were not listed. It added: ‘Over the course of the past eighteen months, there have been developments within Industrial Heat’s portfolio of technologies that have shown increasing promise. Kieran Drake, analyst at Winterflood Securities, the trust’s broker, said: ‘This is good news for Woodford Patient Capital, with the significant boost to the NAV taking it back above the value at launch. This above comment is interesting since it indicates that the 357% write up is due to IH raising $50M of new money at the $4 bn valuation… Wow. Puts stuff into perspective looking at the actual assets of IH. I cannot describe it as anything else than a giant balloon about to explode. And as I said before – The only way this could even be remotely justified (not even then) is if Rossi technology does not exist. This explains a shitload of actions taken by the trolls and astroturfers on the interwebs since the fall out of the license agreement in April 2016. Looking back at the court documents there are some real gems describing the assets and strategy of IH. First the communication between Darden and Woodford is interesting to understand the importance of Rossi in the portfolio that Woodford invested in. Actually as late as November 2, 2015 (which was almost at the end of the 1 year test) they held Rossi as their no 1 item of their status report. This does of course prove that the whole story told in the court case from IH/Cherokee/Darden and their lawyer drones is complete BS. Also it is interesting how they present Rossi as THE KEY INDIVIDUAL. Except for Brillouin that did raise external capital and has shown performance on the Hot Cat level of Rossi of 2014, no significant results have been shown anywhere close to commersialization. It is reasonable to conclude that Rossi has at least a 5 year tech advantage at the moment. If being positive then maybe these assets could be valued at purchase price, and if maybe IH also have some other minor assets – cash, condos or whatever, then a $100M valuation could be argued, but my take it is closer to $10M. Anyway IH is heading for a depreciation of about 99%, but probably more likely another Cherokee/Darden Chapter 11 Exit. This is of course neither good news for Cherokee / Darden or Woodford Funds – who seams to be the main invester. And neither for the shareholdes of these Woodford Funds (mainly their PCT fund) that are looking at a 10% hit. At the same time Rossi is making significant progress with his HaaS (Heat As A Service) business offer already having orders in four countries and at least one operating plant. Needless to say the focus of IH hitman Dewey Weaver and his troll army is to produce FUD but as we have seen also serious threats are made against anyone who is not bashing Rossi. Dewey Weaver is as we know a share holder of IH, but also a consultant. 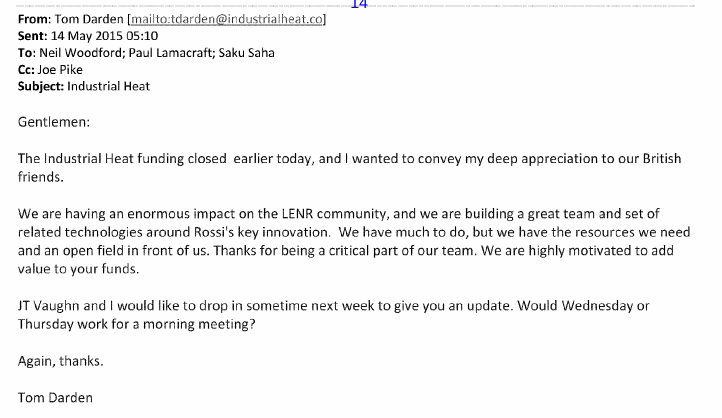 He was supposedly the one vaccuming the market for LENR IP assets, that are now in the IH IP portfolio above.